I was reading my March 2009 issue of Bon Appetit and came across this interesting list of Sushi Etiquette provided by restaurant editor, Andrew Knowlton. You don't have to fumble with those chopsticks any longer! Enjoy! 1. Always sit at the sushi bar. Make eye contact with the head sushi chef (traditionally the one closest to the entrance), or with the junior chef nearest to you. Ask what's fresh: This shows you're serious about your sushi and makes it more likely you'll get the freshest fish. 2. When eating nigiri sushi (rice topped with fish) or sushi rolls, use your hands, not your chopsticks (since the loosely packed rice in well-made sushi will fall apart if pinched). For sashimi, use chopsticks. 3. Don't drown the fish. You know how some people immediately dump salt on their food? Among sushi fans, the equivalent is a person who immediately dunks into soy sauce. A little is fine, but don't dip the sushi rice-side first--it will crumble. Instead, flip the piece over and let the fish barely touch the liquid. 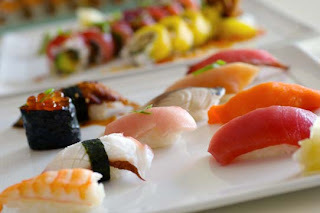 As for what to do with the wasabi: Nigiri sushi already contains a bit of wasabi between the rice and fish; when eating sashimi, a little wasabi mixed into your soy sauce is okay. 5. Eat in order. Appreciating sushi means detecting subtle flavor, temperature, and texture. Start with sashimi, then sushi with rice, then miso soup. Pickled ginger should be eaten only as a palate cleanser between bites. And if what you're eating contains cream cheese, pineapple, barbecued pork, or fried chicken, it's not really sushi. THANK YOU!!! I've always wondered if we could use our hands with the rolls and if one bite was the way to go.